where #(w) is the number of Google search results for the query w enclosed in quotes. This approximation could be improved by replacing "and" with "*", so that the words aren't necessarily separated by the conjunction "and". 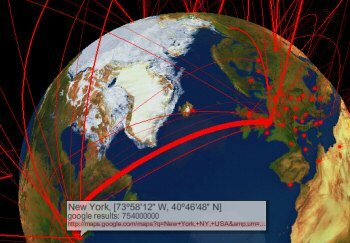 The Google distance is multiplied with the physical distance between cities to increase the connection between cities that are far away. Among the cities that have a small "informational" distance: London and New York, Tokio and Sydney, London and Singapore City. Another way you can use the number of Google results is to calculate the mindshare of a word or name within a domain. If you divide the number of search results for [nokia mobile phone] by the number of results for [mobile phone] you can find Nokia's Googleshare within the mobile space. Worth mentioning the keyword "googleshare" or "mindshare" when people want to find similar experiments. You feel that dancing fantasy. That magical big city sound." I've updated to post with a small paragraph about Googleshare and then I noticed your comment. CenturyShare and Googleshare Map are two interesting spin-offs. On this same topic, you might be interested in this paper from 2007.